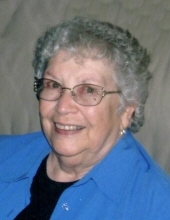 Dorothy M. Holmes, 85, died in the Marshfield Medical Center in Marshfield on Tuesday, April 2, 2019. Surrounded by her family who loved her dearly and will always keep her in their hearts. She was born in Phillips on December 12, 1933, the daughter of Myrl and Nedra (Newton) Cress. She was a 1952 graduate of the Phillips High School. On August 23rd, 1952, she was married to Max Holmes. Dorothy was a member of the United Methodist Church. She was employed by Phillips Plating for many years until the time of her retirement. In her free time she was a busy lady, cooking, baking, reading, embroidering, crocheting, and quilting. She especially enjoyed family gatherings and playing cards. She is survived by three daughters, Merry (Lee) Kempen, Pewaukee, WI, Peggy (Greg) Minks, Kennan, Susan Bushman, Phillips, and one daughter-in-law, Kate. She was a loving grandmother of 10 grandchildren: Nathan, Jason, James, Scott, Tim, Sara, Kyle, Adam, Joel, and Katie; by 10 great grandchildren: Willow, Henry, Lucas, Nickolas, Leo, Ellie, Maya, Avery, Max, and soon to be born, Bo. She is also survived by two sisters, Rachel (Glenn) Houck, Bloomingdale, IL, and Betty Baratka, Phillips; and by two very dear friends, Carolyn Norum and Shirley Cress. She is preceded in death by her parents, Myrl and Nedra Cress, by her husband, Max, on August 25th, 1998; by one son, Randy; by one son-in-law, Fran Bushman; by one brother, Russell; and by three sisters, Pat Dinger, Jane Campbell, and Arlene Price. Memorial services will be held at 11:00 A.M. on Saturday, April 13th, at the United Methodist Church in Phillips with Rev. Rick Haberland officiating. Friends may call at the church on Saturday, April 13th, from 10:00 A.M. until the time of services. Inurnment will be in the Lakeside Cemetery in Phillips. \The Heindl Funeral Home in Phillips is assisting the family with funeral arrangements. To plant a tree in memory of Dorothy M Holmes, please visit our Tribute Store. "Email Address" would like to share the life celebration of Dorothy M Holmes. Click on the "link" to go to share a favorite memory or leave a condolence message for the family.